Bass fishing marks – Where do I look in winter? A very common question that anglers wishing to catch Bass will ask is how long is the season? In fact, it’s often the very first item on my clients list of things they want to learn. I’ve received quite a few emails and queries recently related to whether it’s even worth lure fishing for Bass in the Winter? My answer is that while the sea temperature remains in double figures and until we see a continuous stream (weeks) of very strong winds caused by Atlantic depressions or a particularly long and severe cold spell, then I firmly believe they will be inshore and catchable – maybe not in huge numbers but certainly catchable. But whether you’re a ‘die hard’ bait/beach/surf angler or a full-blown lures or nothing kind of guy (or girl) the most important aspect of being successful (from the shore in the context of this post) is to actually find where Bass could be. Once you’ve achieved this, it is then onto finding the conditions (weather/tide/sea state/time of year) through trial and error in order to ‘work out’ when it might fish consistently. Firstly – During the months of June/July there were (as you’d expect) a lot of sandeels in the area. One of my most consistent lures around this period was the Hokkaido Metsuki 130F (Silver Bullet colour) – maybe the Bass were focusing on chasing down what is essentially a sandeel imitation? (see below). Secondly, there was a definite switch in November (following a few heavy frosts/cold nights in seemed) when the Bass didn’t appear interested in chasing shallow diving hard minnow or surface lures. Yet as soon as I switched to fishing paddletails, like the Illex Nitro Sprat hard on the bottom, I almost instantly started to catch them – maybe they were grubbing around on the bottom looking for more substantial meals after possibly feeling the onset of a long cold spell? A lot of my rugged/weedy/rocky very shallow reef marks (where there is a decent amount of tidal current ripping through) were fishing well (on lures) in August and September – maybe the Bass were very mobile and content to swim/travel in the flow of the flooding or ebbing tide due to higher water temperatures? In October and November I made a number of catches by ‘bouncing’ the articulated paddletail lures (like the one above) in areas where there was an open expanse of sand but within coves or bays – maybe the rougher sea conditions allowed them to scour the sand for an easier meal ready to fatten up for the winter? 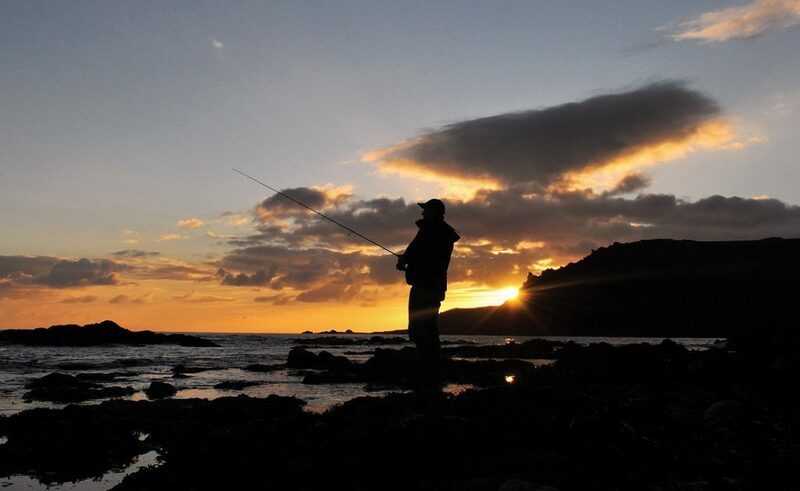 Location dependant of course, by this of time of year many anglers have, or are considering fishing for different species or have placed the lure gear away until the Spring. 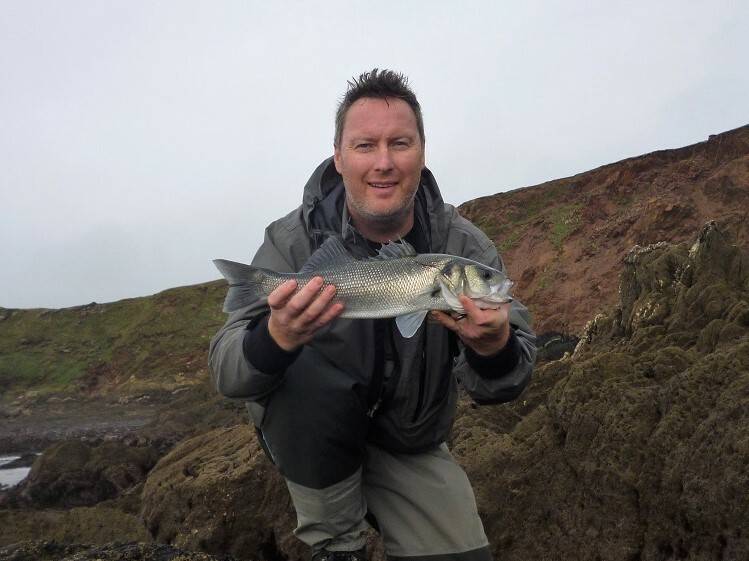 I am extremely lucky of course, in that Bass can be caught on lures virtually all year round here in South Devon. However, what is noticeable is that the numbers do generally decrease in the depths of Winter – certainly into February and early March. So if you’re intent of fishing through the Winter yourselves, what kind of marks could you fish and what kind of tactics should you employ? My last two lure fishing sessions have been a bit of an eye opener and very satisfying in that I really, really had to go through the process of thinking – Where could the Bass be? So with that personally acquired information burning away in my mind, the next morning I was scrolling through my marks on Google Earth, in addition to my photographs of certain marks… So where did I decide to fish? Two marks really stood out. Both are consistent low tide marks, one of which is only really accessible over spring tides lower than 1.6m (Yealm Entrance scale) while the other one fishes best on a ‘neap’ low tide (between 1.6 – 2.2m). Due to other commitments, I had to fish the last 1 – 2 hours of the ebb and the first hour of the flood, rather than the first 3 hours of the flood (something I might have otherwise completed) however, it turned out to be a good decision! As yet, I haven’t managed a real monster this Autumn/Winter… however, the size of the fish I have caught has been in and around the 3 lb bracket – vey similar to the June/July period. The first session was conducted over a low spring tide in really dull, very mild, low cloud conditions when the sea temperature was 14 degrees, with about 2 ft of clarity and where a gentle onshore breeze was creating a lovely bit of swell/white water. With the tide still ebbing strongly and armed with a 90mm Nitro Sprat and the matching 14 g jig-head (in the Green Sprat colour) all I needed was a very gentle (10 yard) lob to reach a patch of gravel/sand (5 x 10m) set between an underwater reef and a car sized rock that was now exposed. This mark is at the end of a long promontory of rocks some 150 yards long, where the water is only around 6 ft deep on the lowest tides. First cast I bounced the lure halfway in and then straight retrieved it the other half but nothing… Second cast, this time I ensured that the lure bounced along the seabed all the way in to my stance and literally right under the rod tip a very powerful ‘KNOCK’ (is the best way I can describe it) signalled a Bass! It stayed quite deep initially before trying to power to the right but I always had the upper hand in this battle as I was pretty much directly above the fish when it took the lure, so after a minute or so the fish was slid onto my platform that was covered in soft ‘moss-like’ seaweed (see the image above). A couple of very short casts later but this time only ‘two bounces’ into the retrieve and a fierce take resulted in the Bass below – again taken on the Nitro Sprat. This was a really powerful, thick set fish – a real little brute but stunning all the same! With the tide now nearing its lowest point things went a little quiet but as the tide changed and it started to flood I managed a third slightly smaller Bass in the same way as the previous two. Second mark – Megabass Zonk Gataride lives again! The similarities in the weather and sea conditions (following another week of Easterlies) and an unexpected bit of free time prompted me to head out on this particular day. A neap ebbing tide this time and with only 2 hours of fishing time available, the mark that I had pinpointed saw me try something different in relation to what I attached to the lure clip – a Megabass Zonk Gataride (High Pitch) in the Cruising Blue colour. The seabed on this mark is a mixture of very small sandy patches interspersed with large ‘clumps’ of kelp. I could have gone with a bottom hugging paddletail lure but the swell was really smashing through this area at times and I wanted to keep a lure in the hotspot for as long as possible. As you can see in the image of the mark below (taken on a very low tide last year), there are very narrow gullies in between the reef/rocks and it is within these gullies that I was targeting the Bass. The second mark on a very low tide – casting accuracy is paramount here! Another vital element to this mark is that it effectively runs off of a reef/beach into the deeper water (again only 6 ft deep on a very low tide) as per the image below. Lovely looking ground running off into deeper water – A good ebb tide mark. With one hour of the ebb remaining and with the only difference in the conditions from the previous session being slightly less water clarity (about 1 ft – 18 inches) off out across the rocks I went – intent on catching a December Bass. There’s always a thought process occurring (or quite a few running continuously!) when I’m out lure fishing with the idea here being that the Bass may well be ‘holding’ (like they were on the first mark) very close to the end of the rocks. When you suspect this, in order to ensure that the lure is looking as natural as possible it often pays to move a few yards further away, to an area where you can effectively cast and fish the lure correctly into what could be the hotspot- things like this are sometimes vital to your levels of success. Initially however, the way that the waves were breaking/foaming/bubbling around the rocks warranted searching out into those gullies – all the while trying to keep the ‘Zonk’ fluttering and wriggling for as long as possible in amongst the turmoil and all the way up to the rod tip – in case a Bass attempted one of their famous last split second lunges, that are common in these conditions. As suspected it took a slight adjustment to my stance and casting angle (so to ensure the lure was worked as close to the end of the rocks as I dare) when a very sudden ‘YANK’ followed by another ‘YANK’ on the rod presented me with a Bass (no doubt given the ferocity of the take) to contend with in the melee. With the rod and reel under some strain I initially thought that this might be a really decent sized fish but the reason for the ‘double hit’ soon became apparent – the fish was slighty foul hooked under the chin. All the same this was another Bass around the 3 lb mark in what is officially Winter so I’m certainly not going to complain! The apparent positioning of the Bass. They were all caught very near to me (ranging from 1 – 6 yards). 3 out of the 4 fish were caught on the final hour of the ebbing tide. The Bass appeared to be holding very close to the base of the rocks. I’ll be really chuffed if reading this post assists someone in catching what can be a real achievement at any time of the year, but something that is becoming more and more common – a Bass on a lure in Winter. Great read again Marc. My son has a new spinning rod and reel and a box of goodies from his Grandma for xmas. So we will definitely be looking to find a winter bass over the xmas break. Thanks!!!! Great stuff Lee! I hope you have a great Xmas topped off by a Bass of course!